“Wow!” Not one of my more articulate moments but that is all I could say at the very moment I walked through the red sandstone gate and took in my first view of the Taj Mahal. My jaw literally dropped at the splendor of the white marble against the clear blue sky. The delicate carvings appear like lace in a beauty befitting a queen and the shallow pools leading up to the building reflecting the beauty up into the heavens. That sight alone was worth every minute of the drive there, which was actually quite pleasant. My expectations for an arduous journey had been set well before I went to India by a friend that had traveled there a few years prior. Other than the traffic getting out of Delhi and getting into Agra, the trip was a peaceful journey using the Yamuna Expressway across flat green-brown fields punctuated by yellow mustard fields and the chimneys of brick furnaces rising up through the morning haze. A mere 3 hours after leaving the house, we made it to Agra. Agra has not yet figured out the necessary infrastructure to support a monument of such magnitude with the average 20,000 people who visit this New Seventh Wonder of the World daily. A mad chaos of cars, trucks, motorbikes, rickshaws, bicycles, and cows sluggishly made their way through the town, across the river, around a sharp U-turn along the river and finally into the streets around the Taj Mahal. I think the only people not really bothered by it all were the cows. Once parked, the car was instantly assaulted by people wanting to sell books, post cards, magnets and I have no idea what else. Narrowly escaping them and the many touts offering rickshaw rides to the gate and the people offering to be a guide, we bought our tickets. Entering a big attraction like this is when being a woman in India is a benefit. Separate entry lines are designated for Gents, Gents with High Value Ticket (i.e., foreigners that have to pay 750 rupees instead of the 20 rupees Indian and SAARC people do), Ladies and Ladies with High Value Ticket. We had the shortest line possible, Ladies with High Value Ticket. Other than being a “guide”, locals make money by offering to take pictures of people in all the classic poses (on the bench, standing, making it look like you are holding the Taj Mahal by the top spire). The fee is about 50 rupees per shot, and it is actually worth it. So after going through the photography session, which I can’t complain because our guy took the same pictures with my camera that he was also taking with his, I was able to really take in the beauty of the place. The Taj Mahal is built with perfect symmetry, with Shah Jahan’s beloved wife’s sarcophagus at the center of it all. (The only exception is the sarcophagus of Shah Jahan which was erected beside her sarcophagus.) Looking at the large white dome, flanked by two smaller domes to each side and accompanied by four white minarets reaching into the clear blue sky, the symmetry of it all is subconsciously taken in while marveling at the beauty. Entering the mausoleum, the awe continues. The marble screen surrounding her tomb is carved into a detailed latticework, each panel being carved from a single piece of marble. The walls are bejeweled with flowers and borders made from rubies, lapis lazuli, and malachite. 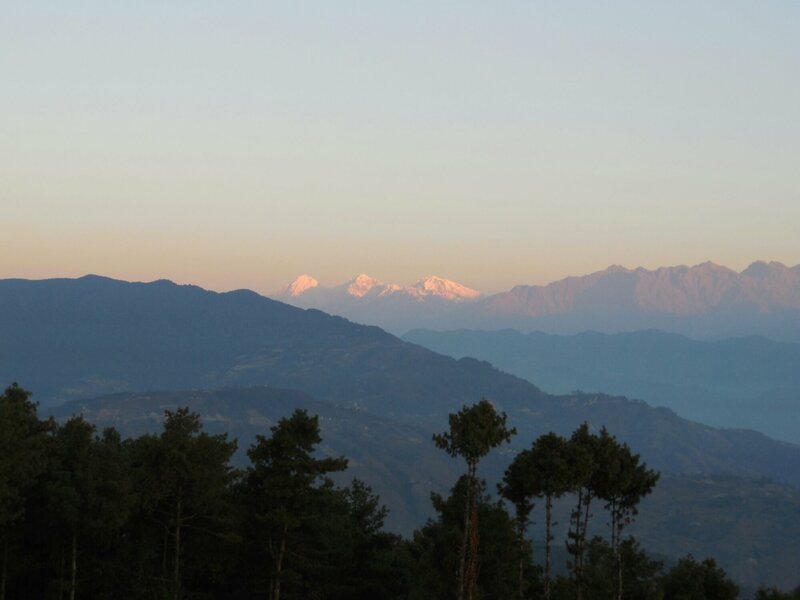 The intricate beauty of the place can scarcely be elaborated by mere words. As a person that generally travels alone, I know how nice it is to actually have pictures of yourself at the places you visit. I also think that it is nice to offer to take pictures of couples instead of them taking a picture and trading places. The first couple I offered to take their picture, had apparently heeded the advice to not let anyone offer to take your picture for fear they will run off with your camera. Being an honest person, I felt a little sad by their reaction. The next couple I offered to take their photo also appeared hesitant, so I offered to let them hold my camera while I took their picture. That made them relax. And after I took their picture, they insisted on a picture with us in it. 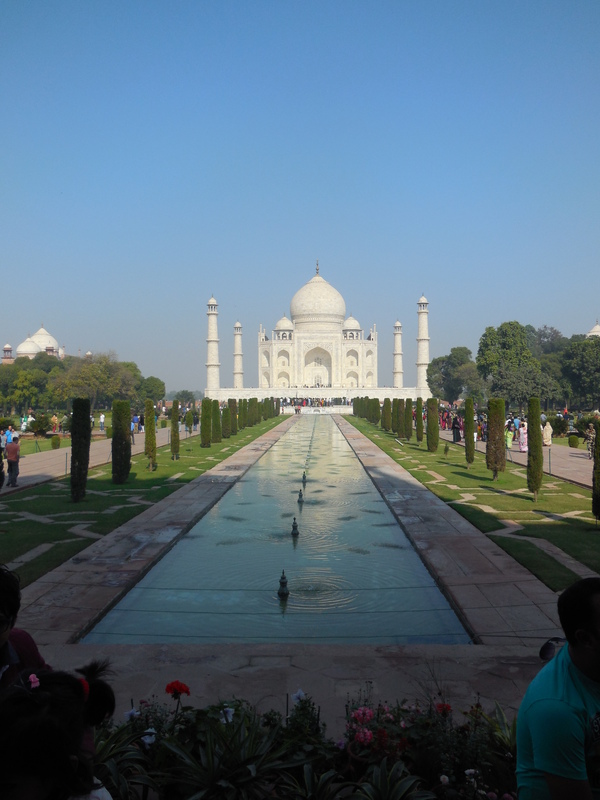 After lunch and collecting my photos, we headed to a park on the opposite side of the river from the Taj Mahal. Working our way back through the Agra traffic was again a bit of a challenge, taking longer than you would expect in a small town. The near deserted park provided a peaceful view of the Taj Mahal and a chance to take pictures that are void of other tourists. 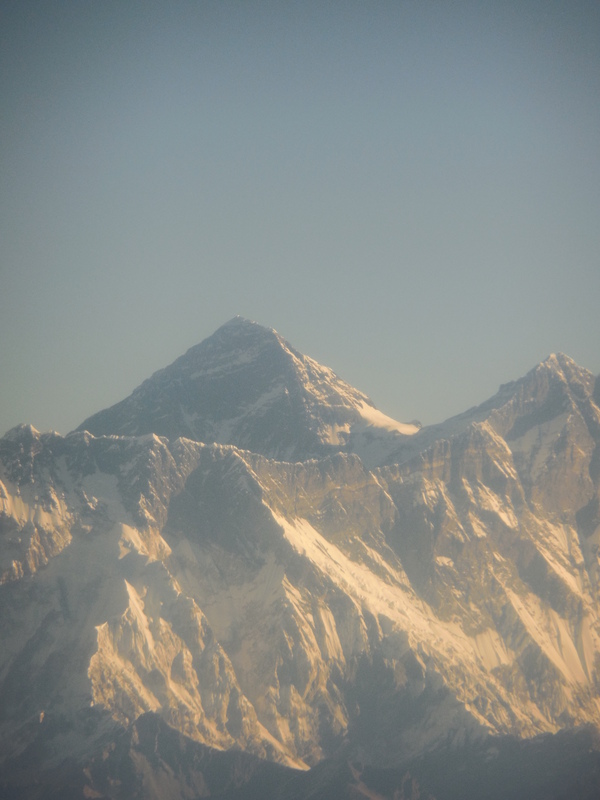 After easing into India culture the first part of my trip, I finally took the plunge and dove into it head first like it was an ocean of cold water. Delhi By Cycle offers bicycle tours around Old Delhi. Instead of just looking at the chaos that is Delhi, you actually get to experience that chaos first hand by riding a bicycle through it. Meeting at 6:30 AM, we climbed on our bright orange bikes and off we went. Flanked by our guides in their bright orange jackets, we rode through alleys that were barely wide enough for our bikes and a person to pass, past people starting their day around fires of burning trash, through slightly wider alleys, and along busy streets. Going on the tour was a truly incredibly way to experience Delhi. Along the way, we stopped at particular points of interest for our guides to explain various landmarks and to snap the occasional picture. We made stops to look at the old British architecture of buildings long since empty but still owned by families and to gain some history bout the city. We stopped to see places such as the Red Fort, St. James Church, and the Jama Masjid mosque. In some places, local people would gather to see the tourists and maybe to listen. 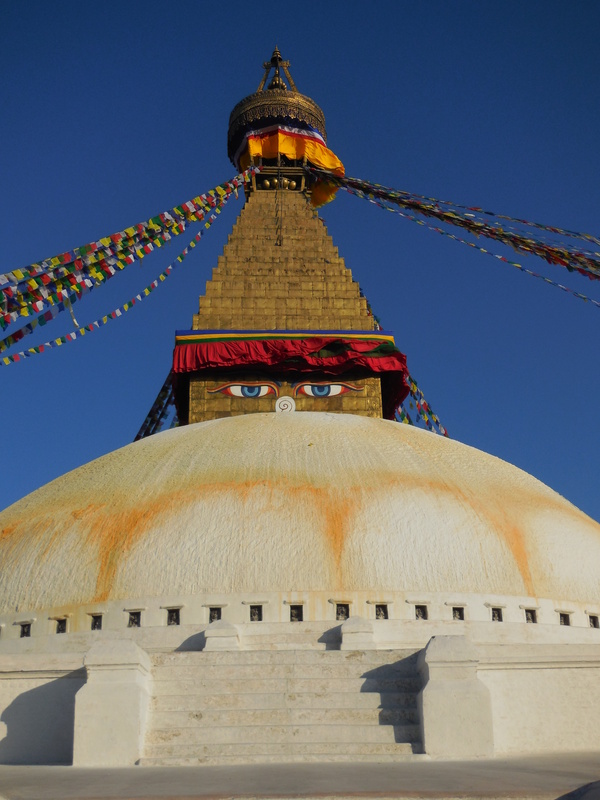 On a couple of occasions people begging for food or trying to sell trinkets approached the group and were quickly shooed away through the sternly spoken Hindi words by one of our guides. Most of the time, the people along the way would just say “Good Morning” or “Hello” as we passed by and the kids would stare at us wide-eyed and a little shy. Looking around at the people gathered around small piles of burning trash or that are washing at the community water pump, the initial gut reaction was a bit on the side of “what a terrible existence this must be.” Going beyond that paradigm, I started realizing that this is just their life. Homes do not have running water or central heating. And these activities are their morning rituals, no different from anyone waking up anywhere in the world. The olfactory assault was a little harder to get over. The combined smells of urine and burning trash resulted in a pungent combination. Women sweeping the area in front of their homes continually stirred the urine scent as it mixed with the dust and was catapulted into the air. The smell of trash burning was layered onto pf the already pungent smell. In particular the man burning a large plastic tarp, the odor of melting plastic permeating the air. All of this combined with the exhaust from the cars, trucks and motorbikes and the general smog that hangs over Delhi left an acidic taste in my mouth and throat. 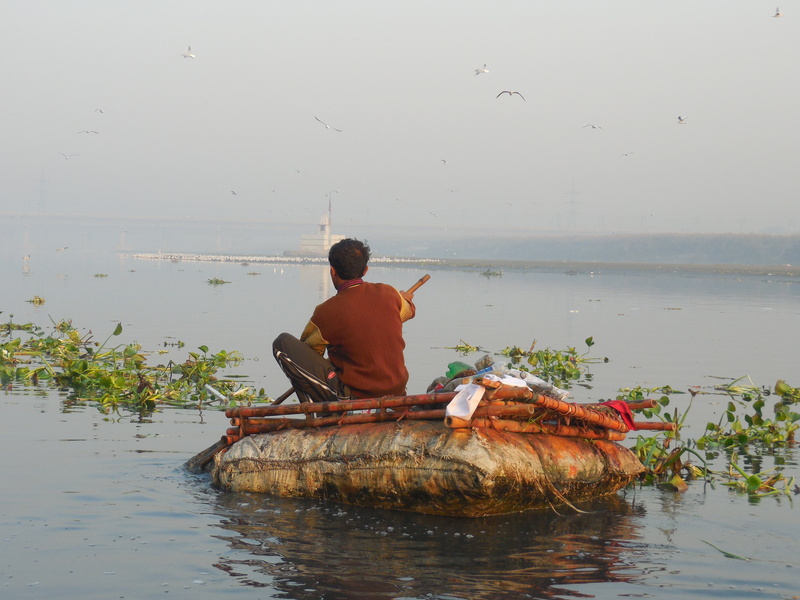 The highlight of the Yamuna Tour was a short boat ride on the Yamuna river. Leaving our orange bikes under the watchful eye of one of our guides we made our way over the flood barrier wall to a home situated on the bank of the Yamuna river. Donning life jackets we climbed into the small boat that was rowed downstream while our guides explained various facts about the river, such as 18 sewage/rain drains dump directly into the river and the lotus like plants on the river are merely remnants from cremation ceremonies. We passed by a person on his barely buoyant makeshift raft collecting trash from the river to sell. We finished our river tour with a viewing of the cremation grounds (Nigambodh Ghat) where the last vestiges of one of the morning’s cremations was still burning and the ashes from another ceremony were being cast onto the river. After a chai break, we hopped back on our bikes for more of the city life. We passed by the large group of men gathered in the hopes of finding some work for the day. Another large group was waiting in line for polio vaccinations. The morning ablutions had given way to the start of commerce. Food cooking provided an olfactory respite. Fruit stands and stores were starting to open up. During this stretch of the ride it was imperative to start making friends with the bell on the bike and how to use it, as the number of people, bicycles and motorbikes in the alleys had increased significantly. By the last bit of the ride, I felt like a true participant in the conversation of honking and bell ringing. Short rings to let people know that you are there, longer more insistent rings to try to urge people to get out of your way. At the end of the tour, Mr. Joseph came to collect me and continue on with my day of sight-seeing. First stop was at the Red Fort, the primary landmark that I wanted to see. 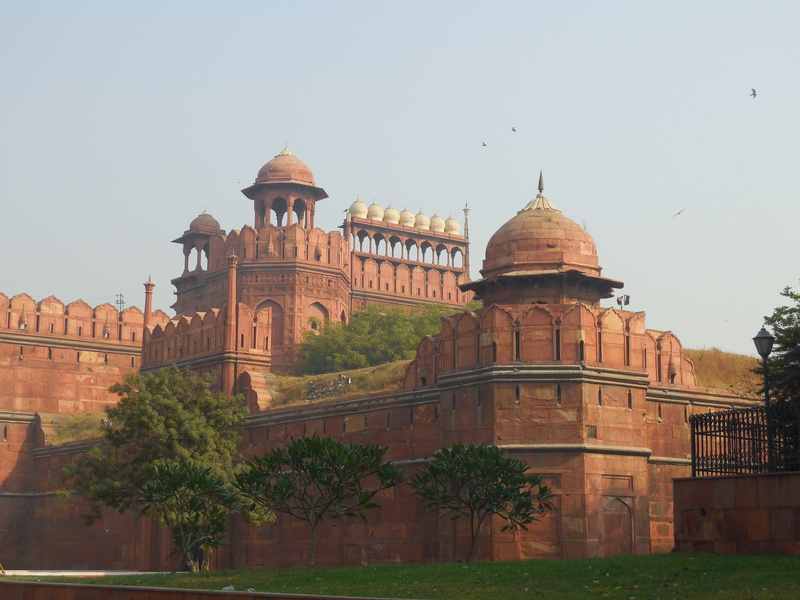 The impressive red sandstone walls are another testament to the incredible appreciation Shah Jahan had for architecture. 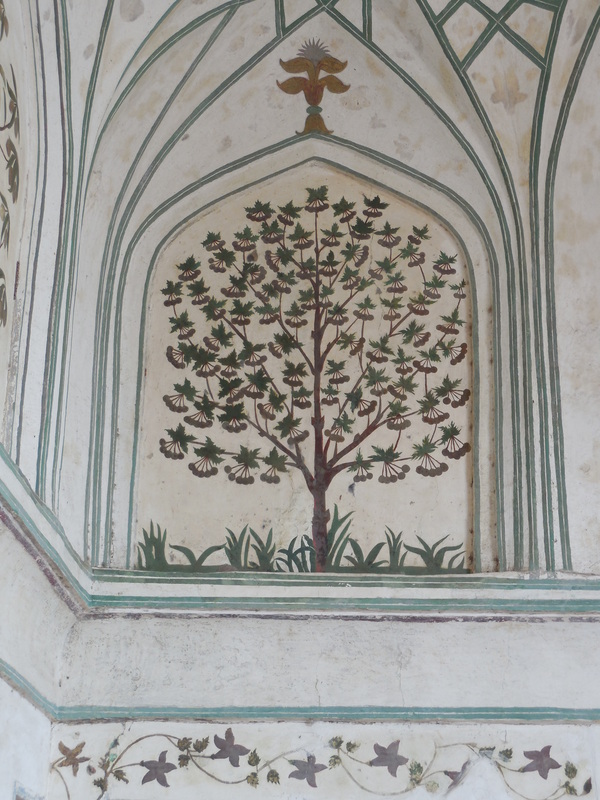 Many of the inner building are made from white marble, with inlaid stones and carving similar to the Taj Mahal. The smooth white marble providing a lovely contrast to the rough red sandstone. It was only noon and I was on stimulation overload between the sights and smells of the bicycle ride and the hordes of school children at the Red Fort who wanted to take their picture with me. To add to the over stimulation, I ended up going out the main entrance of the Red Fort and walking along the street for some distance. Immediately after exiting the compound, I was flooded with taxi drivers and rickshaw drivers and tuk tuk drivers all asking if I needed a ride. In retrospect, it might have actually been worth 20 rupees to have them take me the short distance to the parking area. The night before I had discovered that the charging cord for my tablet had died. Our main objective for the afternoon was to find a replacement cord. It is at times like this where I wish I didn’t have a tablet that uses proprietary adapters for their power supply. First we went to Kahn Market, an area with several electronics stores. Mr. Joseph and I went from store to store asking them about a cord, several of them trying to say that it was the same as an iPhone 4 cord, and others just looking at it, shaking their head and saying to try the next one. The consensus was that, if there was an ASUS tablet cable to be found in the city of Delhi we were going to need to go to Nehru Place. After a lunch break, a pleasant place recommended by Mr. Joseph, we headed into the Delhi traffic to Nehru Place, which is most of the way across Delhi. At this point, let me just say that Mr. Joseph is a saint. Nehru Place is a morass of electronics vendors and people offering software and laptop laminating. I didn’t think it was possible to actually hock that much software. Mr. Joseph persistently guided me through the place, again stopping at several stores. Strangely, the ASUS store didn’t have a cord but sent us to 107-A in another building. 107-A is a small niche in the wall where we found a young man who apparently had all the necessary connections and minions to carry out his bidding. He was able to produce not only a charging cable but also a converter plug so that I can still use the charger when I get back to the States. And if the charger should have problems, it has a 3 month guarantee. The last stop was the Lotus Temple. A Bahai temple designed to look like a lotus flower, the bud of the lotus formed by the white architecture and the opening petals pools of blue edged in white stone. Having seen the temple from the air, it gave me a whole new appreciation to how far across the city we actually were. Partly out of not wanting to keep Mr. Joseph waiting too long and partly out of exhaustion and overload, I stayed just long enough at the temple to take my shoes off, walk around the temple, read a little about the Bahai philosophy and reclaim my shoes. The temple is really beautiful and a very unique piece of architecture. Driving in India is truly an art to be appreciated. With all manner of vehicles vying for their spot in what first appears to be a discombobulated mess, it is possible to eventually discern a vague pattern to it all. Traffic lanes are quickly abandoned. Details like turning from the furthest lane left or right is a convention that is also mostly abandoned. Vehicles insistently make their way into lanes or across traffic, usually resulting in a cacophony of honking. The horn (or bell for bicycles) is the primary means of communication. Long and insistent honking to indicate the desire to pass or the irritation that you are in their way. Short honking to say I’m here so watch what you are doing or that I am going to make my way through this traffic no matter what. Painting on the back of trucks remind other drivers to “Blow Horn” so that they are aware you are behind them and want to get around. Honking becomes so insistent that it is easy to believe that drivers must honk their horn every 20 seconds or they will go into withdrawal. Some horns are solid and strong commanding attention. Other horns make you laugh at the weak attempt to demonstrate their presence. The high-pitched tweedle-tweedle-tweedle-tweedle of the large trucks almost laughable for the oxymoron the sound creates. Just navigating the tangled mass of roads is an impressive skill. Being a former part of the British empire, the layout of streets in Delhi make pervasive use of traffic circles. Each traffic circle looking almost identical to the one before, just differing in the number of spokes coming off the circle. The center most often green and occasionally boasting a statue, the curbs painted yellow and black. Adding the traffic with cars going every which way requires adept driving and amazing knowledge of quickly knowing where you are going lest you get caught going around the traffic circle again and again. My admiration for Mr. Joseph grew with each successive time we headed off into traffic. This quiet man had such a solid approach to driving that seemed to be in direct contrast with his outward demeanor. Rarely did he ever get riled by the traffic. He simply played his part in the dance, honking when necessary and being insistent in getting to the front of lines at stop lights and crossing across traffic (either perpendicularly to or in line with the traffic) always ensuring the safety of his passengers. Not only did he navigate the traffic expertly he always seemed to know exactly how to get to where he was going efficiently. India takes public safety very seriously. Perhaps if this level of attention was upheld locally, we wouldn’t have some of the problems that we do. The security is consistent across airports and tourist monuments. All the bags, whatever you happen to be carrying, are scanned. Then you queue up in the appropriate line, ladies in one, gents in the other. After walking through the metal detector, you step into a small screened off area where you receive a pat down by the same gender official, often including the use of a wand to check again for metal. At first this whole process feels a little invasive from a western perspective, that is until you gain the appreciation for the seriousness at which security is taken. The importance of security checks extends beyond the scanning of bags and people. During my shopping expedition to Nehru Place, we had to park in the garage. Prior to entering, we were required to stop so that an offical can scan the undercarriage of the car using a mirror. I’m sure a visual scan of the interior is made as the official walks around the car with the mirror.